Tigerville, S.C.—North Greenville won the longest game in program history on Friday night with a 5-4 win over Mount Olive in 16-innings. The Trojans took a 2-0 lead midway through the game with a single run in each of the fourth and fifth innings. The Trojans took the lead using three hits and an NGU error in the fifth to put NGU in the two run hole. The Crusaders broke through in the seventh inning as Mitchel Painter’s single to left field scored Jessep Polk to cut the Trojan lead in half. NGU would then score two runs in the eighth inning to take a 3-2 lead. Foley George would account for the hit that led to the tying run as Jae Roberts scored on an error. The go-ahead run would also score on the play as an errant throw reached the NGU dugout, scoring Bennette Hill from third. A leadoff homer in the ninth inning would even the score at 3-3. The Trojans would strand two runners in the frame as reliever John Leopard picked up the final out on a strikeout. The two teams would strand 13-runners combined in innings 10-16. The first run of extras would come in the Mount Olive 16th as a hit-by-pitch with bases loaded scored the go-ahead run for the Trojans who would leave the bases loaded. 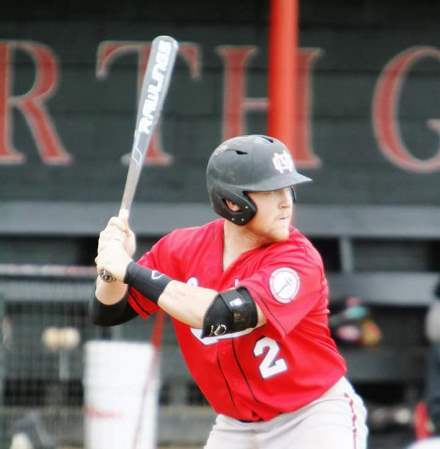 North Greenville wasted little time setting the table for a win of the walk-off variety. Jae Roberts and David Houser would set the table with back-to-back singles. Roberts would then come around to score on Nathaniel Maggio’s single to even the score at 4-4. Hunter Dilworth would then come through for NGU with a sacrifice fly in his second at bat of the game. Dilworth’s sac would score pinch runner Collins Robinson from third base who slid around a tag attempt to give North Greenville the win. The Crusaders improved to 15-8 on the season and 7-0 in league play while the Trojans dropped to 9-7 overall and 4-3 in Conference Carolinas. The two teams will wrap up the three game series Saturday afternoon with a double-header beginning at 1pm.